The Guangzhou Taxation Bureau launched 12 measures to optimize the business environment on March 13. On March 2, the People's Government of Guangdong Province held a press conference to promoteGuangdong-Hong Kong-Macao Greater Bay Areaconstruction and introduce progress made and future plans. On Feb 19, after the “Outline of Development Plan for Guangdong-Hong Kong-Macao Greater Bay Area” issued by the Central Committee of the Communist Party of China and the State Council, Ma Xingrui, governor of Guangdong Province, took a special trip to the Nansha District of Guangdong Pilot Free Trade Zone to conduct research. On Feb 18, Fengtai Civil-Military Integration Equipment R&D and Production Base Project started at Shunhe Industrial Park, Lanhe town. 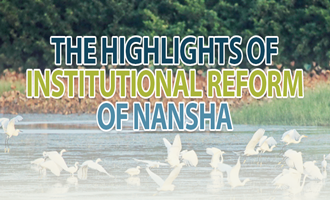 Nansha published a list on the government's public website clarifying the state, provincial and city policies that have affected investment in Nansha in recent years. 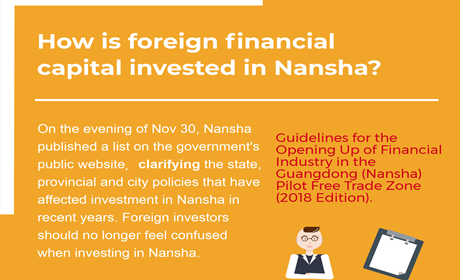 Foreign investors should no longer feel confused when they want to invest in Nansha. 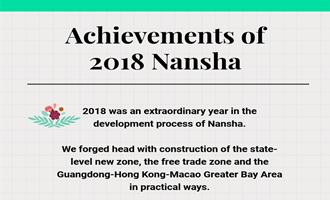 The company having its place of business registration, tax collection and territoriality statistics settled in Nansha, with an independent legal-person status and with no less than 3 Subsidiary holding companies or branch offices. Foreign students of overseas universities invited by enterprises in the 9 Cities of the Guangdong-HK-Macao Greater Bay Area to carry out their internship. Foreign nationals of Chinese origin who start new business in the 9 cities of the Guangdong-HK-Macao Greater Bay Area.